County Shores Farms began as a small business venture by the owner's oldest son, Andrew, who began producing maple syrup on the farm a few years ago. Since then, all three children have began their own business ventures and County Shores Farms was created. Each of the owner's children, Andrew, Connor and Bethany work hard at the farm between school, hockey and 4H Clubs to produce locally grown products that are sold at the County Shores Store. 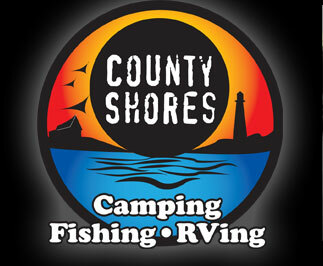 Currently, County Shores Farms produces honey, farm fresh brown eggs, roasting chickens, fresh vegetables and much more. The children have plans to continue to expand their farm operation and have begun selling some of their produce at local farm markets and festivals. Read below for more details. After a school trip to a local outdoor educational Centre, Todd and Krista’s oldest son Andrew, became fascinated at the process for making maple syrup. A few months later while on the farm, Andrew identified maple syrup trees on the property and got the idea to start producing his own syrup. After researching the entire process, Andrew asked his parents for maple syrup making supplies, instead of a hamster that year for his birthday. 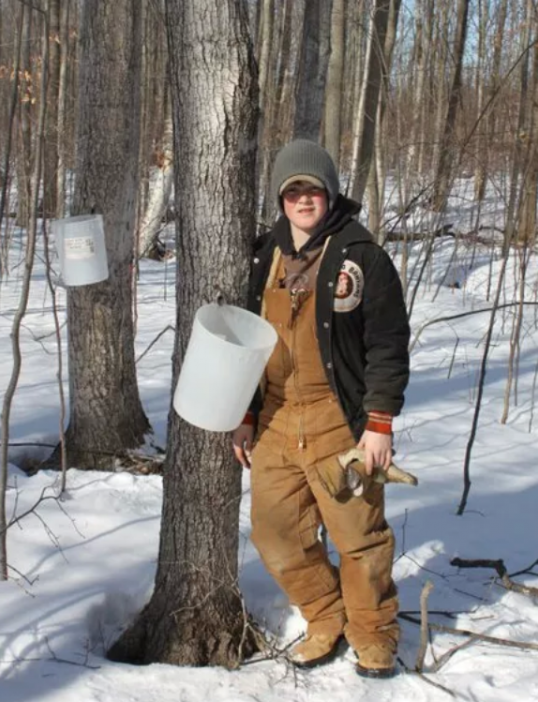 In his first season, Andrew tapped about a dozen trees and produced about 5-8 litres of syrup. He sold his syrup to family and friends and re-invested his earnings into equipment and supplies to increase production. In 5 years since beginning his maple syrup operation, Andrew now has 185 taps and produces over 100 litres of syrup a year. Andrew does all the work himself, in the winter he collects sap from the maple trees, evaporates the sap into the early hours of the morning and bottles it all between school, work and hockey. He now sells his syrup at County Shores and at local markets and festivals. So the next time you are at County Shores, be sure to pick up a bottle or two of his delicious syrup produced on site, and if you are interested he would be more than happy to give you a tour of his operation and explain the process. You can also read more on the maple syrup making process here. After seeing his older brother’s success in the maple syrup business, Connor Foster also wanted to try his hand at his own business venture. After careful consideration and much research, Connor decided he wanted to raise chickens. With the help of his parents to build a chicken coop, Connor began raising laying chickens and meat birds two years ago. He began with 25 laying hens and 30 meat birds, Connor sells the farm fresh brown eggs and roasting chickens at County Shores. With his earnings, Connor has now expanded his chicken operation to 65 laying hens. “Raising chickens is a lot of work,” says Connor, “every day I make sure they have food and water, collect their eggs 2-3 times a day and ensure their coop is properly cleaned out.” The chickens go through about 40kg of feed every week and free range throughout the day. Connor says the best part of raising his chickens is seeing the end product on the store shelf. He plans on expanding his farming operation to include raising cattle in the coming years. Not to be out done by her two older brothers, Bethany Foster also wanted to contribute to County Shores Farms with her own operation. With some thought and guidance from her parents, she decided on producing her own honey she could sell at County Shores. This summer Bethany began her business by acquiring two honey bee nucs, each nuc has approximately 10,000 bees. “It was a little unnerving at first when you are standing around 20,000 bees and they are landing on you and you can’t swat at them, but you get used to it really quickly,” she says. She also explained that it usually takes about a year before a honey bee colony will start producing enough honey to harvest, so she is looking forward to being able to bottle her honey next season and start selling it in the store.